Let me tell you a story about the benefits of pomegranate seeds for Alzheimer’s disease. You see, my grandmother had Alzheimer’s disease. I remember every time I drove her around she would ask me when I had gotten my driver’s license. I didn’t have the heart to tell her I got my license 10 years ago. Sadly, she had passed a few years ago at the ripe old age of 90. Although she didn’t always remember certain details about my life, I would always share a particular “super fruit” with her to help boost her brainpower. As soon as she consumed the powerful fruit, it seemed as if she started to remember things again. She was more coherent and we could have conversations. The miracle fruit I’m talking about is pomegranates. She loved the sweet and tart taste of freshly squeezed pomegranate juice and pomegranate seeds. Studies have found that pomegranates can slow the progression of Alzheimer’s disease. Pomegranate seeds and pomegranates are packed full of nutritional goodies that are good for brain health. For instance, pomegranate seeds contain fiber, protein, and some fat in the form of essential omega-6 fatty acids. The fruit seeds also contain vitamins such as vitamin C, vitamin E, vitamin K, folate, vitamin B1 (thiamin), vitamin B3 (niacin), vitamin B5 (pantothenic acid), vitamin B6, and the unofficial B vitamin named choline. Pomegranate seeds are also a good source of minerals, including calcium, iron, magnesium, phosphorus, potassium, zinc, copper, manganese, and selenium. In general, the body can easily absorb the vitamins and other nutrients in fruits and fruit juices like pomegranates, which helps reduce the toxic load that contributes to Alzheimer’s disease and brain health. This is important since Alzheimer’s disease affects half of the American population over 85-years-old. Beta-amyloid is a protein fragment that builds up in the brain until it causes death to brain cells. To fight these clumps a molecule would need to cross the blood-brain barrier. What makes pomegranates so effective for brain health and Alzheimer’s disease? There are several studies that show pomegranate extract contains polyphenols that help prevent the development of Alzheimer’s disease. In a new study published in the journal ACS Chemical Neuroscience, researchers have found a particular compound in pomegranate extract that is responsible for protection against Alzheimer’s disease. When gut bacteria breaks down the polyphenols in the extract, the anti-inflammatory and neuroprotective compounds called urolithins are created. For the study, the research team isolated and found 21 compounds from pomegranate extract. These compounds mostly included polyphenols. Other studies have indicated the polyphenols had failed to cross the blood-brain barrier. That being said, urolithins can break that barrier. They form when a type of polyphenol called ellagitannins are metabolized from gut bacteria. The researchers concluded that further experiments are necessary to confirm whether urolithins can help for Alzheimer’s disease prevention or treatment in human trials. However, the most recent study is far from the body of research on pomegranate and Alzheimer’s disease. For example, other studies have linked another pomegranate compound called punicalagin to the reduction of brain inflammation. As a result, the compound can help slow the progression of Alzheimer’s disease. In a 2014 study published in the journal Molecular Nutrition & Food Research, U.K. researchers from University of Huddersfield found that punicalagin can decrease some inflammation in specialized brain cells called microglia. This type of inflammation will lead to greater destruction of brain cells overall, and allows for Alzheimer’s disease to become worse. The researchers also estimated that there is approximately 3.4% punicalagin in 100% pomegranate juice products. Hypertension, or high blood pressure, is a top health risk associated with strokes and heart attacks. One in three American adults suffers from hypertension. The punicic acid in pomegranate is thought to help lower blood pressure. In a study published in the journal Phytotherapy Research in 2013, researchers found that consumption of 150 milliliters of pomegranate juice daily for a two-week period can benefit hypertensive patients. The study included 21 patients between the ages of 30 to 67-years-old who had hypertension. Another 2013 study found that pomegranate juice significantly reduced systolic blood pressure and diastolic blood pressure. Besides hypertension, pomegranate juice may help reduce other risk factors associated with heart disease. The punicic acid and antioxidant content in pomegranate juice is thought to be responsible for its heart health abilities. In a 2006 study published in the International Journal of Vitamin and Nutrition Research, researchers found significant reductions in low density lipoprotein (LDL) from pomegranate juice in type 2 diabetics and high cholesterol patients. Another 2010 study found that pomegranate seed oil effectively reduced triglycerides and improved the ratio of triglycerides and HDL (high density lipoprotein) in 51 patients with high triglycerides and cholesterol. There is also some evidence that pomegranates may help fungal infections like oral thrush and systematic candida. Oral thrush is caused by an overgrowth of the fungus Candida albicans in the throat and mouth. Oral thrush creates a white coating on the tongue. This can be a sign of the spread of candida throughout the entire body. In a 2010 study published in the journal Research in Microbiology, researchers found that the punicalagin in pomegranate showed strong activity against Candida albicans. Prostate cancer will affect about 200,000 men every year. It is also the most common cancer in men. A 2010 study from University of California, Riverside found that pomegranate juice may halt prostate cancer cell movement. It will also weaken chemical signals that spread prostate cancer. A 2006 study from University of California (UCLA) researchers also found that prostate cancer patients may have lower prostate specific antigen (PSA) levels after consuming eight ounces of pomegranate juice daily. The study included 50 men who had experienced PSA increases after radiation or surgery. Pomegranate may also treat breast cancer, skin cancer, and lung cancer. It is estimated that erectile dysfunction affects 20 to 30 million men in the U.S. The condition is described as the inability to attain or sustain an erection. It affects 30% of adults older than 69 and 22% of those between the ages of 60 and 69. In a 2005 study of rabbits published in the Journal of Urology, researchers found that pomegranate juice increases blood flow and erectile response. Although more research is needed, the research shows promise for men with erectile dysfunction. Other Benefits of Pomegranates: Pomegranate also helps protect against dental plaque and supports good digestion. It also treats arthritis, kidney problems, stress, anemia, denture stomatitis, periodontitis, gingivitis, diabetes, and acne breakouts. It also helps in weight loss and improves satiety. Pomegranate can also improve exercise performance. Click here to learn more about the other health benefits of pomegranates. Juice: First off, it is a good idea to juice pomegranate with a low-speed juicer. When you juice pomegranate, you ensure that no additives or sugar is added to the recipe. Be sure to also toss in the pomegranate seeds for extra nutrition. Pulse: Don’t have a juicer? Not to worry. Simply pulse the pomegranate in a food processor, and pour them through a fine cheesecloth or fine sieve. This will remove the pomegranate seeds and leave behind the juice. Add to meals: Pomegranate can also be added to salads, condiments, and tasty desserts. Also, try adding pomegranate seeds with lentils and coconut oil. Supplements: There are also pomegranate extract supplements available. Combine pepper, salt, cilantro, avocados, and lime juice in a large bowl. Stir in the pomegranate seeds. Now you’re ready to serve. I usually have it with blue flax corn chips. Keep it sealed in the refrigerator until you are ready to serve. Are you tired of plain old cranberry for your holiday celebrations? Switch it up and add some pomegranate seeds to the recipe. It will go great with your organic turkey dinner. Combine all ingredients except for the pomegranate seeds in a medium saucepan and bring to a simmer at medium-high heat. Stir frequently and cook until you hear the cranberries pop. Remove the pan from the heat after five minutes and mix in the seeds. Remove the thyme before serving the sauce. Choose pomegranates with smooth skin without cuts or bruises. Pomegranates should be stored for five to eight days at room temperature in a dark, cool place. Overall, pomegranates have a long shelf life. They will also last about two weeks in the refrigerator. Yuan, T., et al., “Pomegranates Neuroprotective Effects against Alzheimer’s Disease Are Mediated by Urolithins, Its Ellagitannin-Gut Microbial Derived Metabolites,” ACS Chemical Neuroscience, 2015; doi: 10.1021/acschemneuro.5b00260. “Gut bacteria make pomegranate metabolites that may protect against Alzheimer’s disease,” EurekAlert! web site, December 9, 2015; http://www.eurekalert.org/pub_releases/2015-12/acs-gbm120915.php. Pomegranates, raw,” Nutrition Data web site; http://nutritiondata.self.com/facts/fruits-and-fruit-juices/2038/2, last accessed December 15, 2015. Balch, J., et al., Prescription for Natural Cures: A Self-Care Guide for Treating Health Problems with Natural Remedies Including Diet, Nutrition, Supplements, and Other Holistic Methods (Hoboken: John Wiley & Sons, Inc., 2004), 33-39. Murray, M., M.D., et al, The Encyclopedia of Natural Medicine (New York: Atria Paperback, 2012), 276-291, 570. Olajide, O.A., et al., “Punicalagin inhibits neuroinflammation in LPS-activated rat primary microglia,” Molecular Nutrition & Food Research, 2014; doi: 10.1002/mnfr.201400163. Endo, E.H., et al., “Potent antifungal activity of extracts and pure compound isolated from pomegranate peels and synergism with fluconazole against Candida albicans,” Research in Microbiology, 2010; 161(17): 534-540, doi: 10.1016/jresmic.2010.05.002.Epub.June 10, 2010. Leech, J., “12 Proven Benefits of Pomegranate (No. 8 is Impressive),” Authority Nutrition web site; http://authoritynutrition.com/12-proven-benefits-of-pomegranate/, last accessed December 15, 2015. Azadzol, K.M., et al., “Oxidative stress in arteriogenic erectile dysfunction: prophylactic role of antioxidants,” The Journal of Urology, 2005; 174(1): 386-393. Castillo, S., “6 Science-Backed Benefits Of Pomegranates,” Medical Daily web site, June 26, 2015; http://www.medicaldaily.com/pomegranate-health-benefits-fruit-helps-protect-against-plaque-hunger-and-certain-340020. “Pomegranate juice help keep PSA levels stable in men with prostate cancer,” EurekAlert! web site, July 1, 2006; http://www.eurekalert.org/pub_releases/2006-07/uoc–pjh062706.php. Asgary, S., et al., “Clinical Evaluation of Blood Pressure Lowering, Endothelial Function Improving, Hypolipidemic and Anti-Inflammatory Effects of Pomegranate Juice in Hypertensive Subjects,” Phytotherapy Research, 2014, 28(2): 193-199, doi: 10.1002/ptr.4977. Asgary, S., et al., “Clinical investigation of the acute effects of pomegranate juice on blood pressure and endothelial function in hypertensive individuals,” ARYA Atherosclerosis, 2013; 9(6): 326-331. Mirmiran, P., et al., “Effect of pomegranate seed oil on hyperlipidaemic subjects: a double-blind placebo-controlled trial,” The British Journal of Nutrition, 2010; 104(3): 402-406, doi: 10.1017/S0007114510000504, Epub, March 25, 2010. Esmaillzadeh, A., et al., “Cholesterol-lowering effect of concentrated pomegranate juice consumption in type II diabetic patients with hylperlipidemia,” International Journal of Vitamin and Nutrition Research, 2006; 76(3): 147-151. 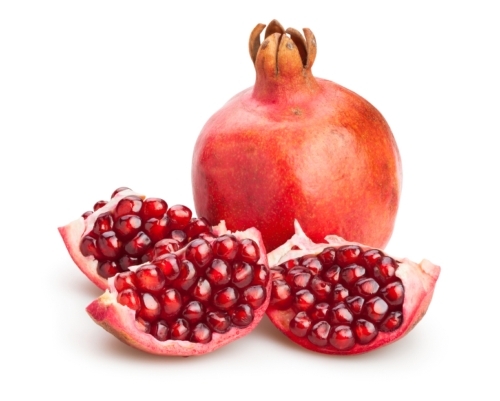 “4 ways to add more pomegranate into your diet,” Erickson Living web site; https://www.ericksonliving.com/articles/2014/08/4-ways-add-more-pomegranate-your-diet, last accessed December 15, 2015. “Pomegranate nutrition facts,” Nutrition and You web site; http://www.nutrition-and-you.com/pomegranate.html, last accessed December 15, 2015.